Kitchen remodeling is a fun project, but it does come with a lot of decisions to make. For instance, you’ll be looking for the best kitchen countertops for remodeling your Rhode Island home. Your kitchen should have great looking countertops that add to the unique look and feel of your home. The countertops also need to be functional and suited to your cooking and space requirements. Here are some tips on choosing the right countertops for your Rhode Island kitchen remodeling project. Our Rhode Island remodeling contractors at East Side Construction are always here to help if you need it. 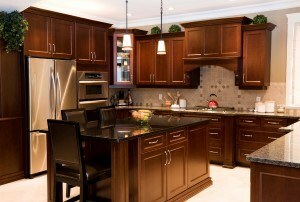 When most people remodel their kitchens, they are concerned with how the final outcome makes the room look and feel. The look of the countertops will make an impact on the final style of the kitchen. There are many options in materials that will bring in different styles to your kitchen. There will probably be many that are well suited for your design style. It can be difficult to make a decision because it’s so important to make the right choice. After all, you’ll be left with that choice once your kitchen countertops are installed. Ensuring the materials and colors you choose are right beforehand is important. There are other considerations which guide your decisions rather than aesthetics. Do you prefer to go “green” with eco-friendly materials? Do you need areas where you can set down hot pots or pans without worrying about the countertops burning? Are you attracted to a smooth, modern look or do you prefer a more comfortable or ornate style? All these questions and more will lead to your final decision. Many homeowners don’t realize how many options there are and wind up going with the majority who choose granite or laminates. But there are many other materials available in natural stone, synthetic materials, metals, concrete, and composites. When you are looking for kitchen countertops materials, you’ll find a myriad of options you can choose from. Once you decide upon the right countertops for your kitchen and other areas of your home, you will need to have them installed. You will get a much better deal from a general contractor than trying to go it alone. Instead of choosing the countertops and then installing them, it’s easier to choose the remodeling contractor first. By choosing a general contractor for your remodeling project, you get full project management and access to a design consultant. You will have information and options handed to you instead of doing all the footwork yourself. With Eastside Construction, our team of designers and professional remodelers will help you choose countertops and will get to work on the installation afterward. You can have standard or custom-built countertops to suit your unique needs. If you have questions about Kitchen Remodeling or are looking for a remodeling contractor in the Rhode Island area, please call Eastside Construction at 401-434-6600 or complete our online request form.